Publisher: National Dance Education Organization (2009). 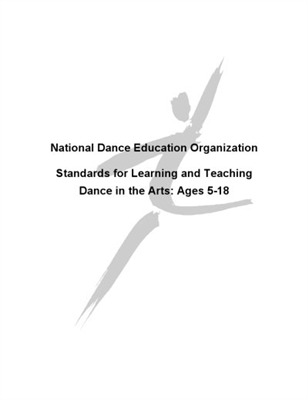 These standards serve as a guide for dance teachers, artists, administrators, and students for the benchmark years of 4th grade (9-10 years), 8th grade (13-14 years), and 12th grade (17-18 years). They outline what students should know and be able to do in the art of dance in the arts-making processes of Performing, Creating, Responding, and Interconnecting. The standards are outlined in the benchmark ages, arranged in a progressive chart, listed in a rubric for assessment purposes, and written in reading levels of 4th, 8th, and 12th graders so that students can use the standards for their own learning and development. Specifications: Spiral bound.